Flower farmer and florist between Bristol and Bath. Wholesale flowers for florists, flower arranging workshops, growing workshops, weddings, funerals, events and sundry hire. Are you happy in your job? I became pretty miserable in my last job and for years I dreamed of changing careers but it took a while to work out what would be right for me. 2017 was my first year of working full time at Pipley after I finally quit my job in March. 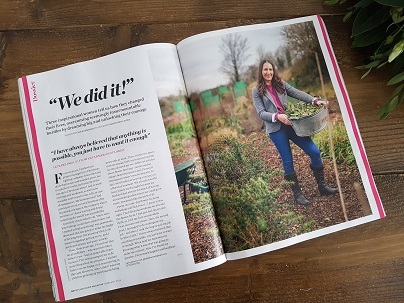 This month Psychologies Magazine have a focus on changing careers and my story is featured alongside other ladies who took the leap. It was great to get a bit of pampering for a change on the day of the shoot, the only unfortunate thing was the time of year as the flower farm wasn’t in its full glory for the photos. My journey into flower farming started with a one day course and I now run something similar myself, so if you are a budding flower farmer have a look on the workshops page at Flower Farming for beginners…maybe it could be the start of something special for you too!